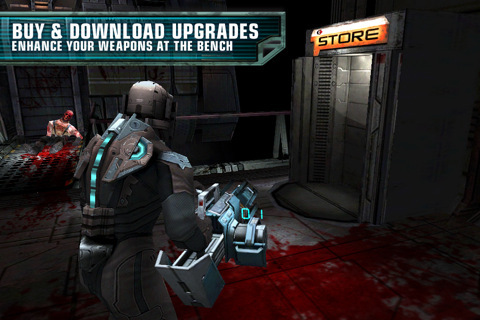 Dead Space by EA Mobile is the latest in survival horror shooters for the iPhone and iPod touch crowd. If killing is your business, then business is good. The iOS storyline of Dead Space takes you on yet another thrilling journey into the franchise that will keep you tuned into your device with its chilling sound effects and 3D graphics. Expect about 4-5 hours of gameplay, and you can run through the campaign in more difficult levels. Dead Space on the iPhone sets the stage for Dead Space 2, and does a brilliant job of it. Don’t expect a slimmed down experience here, but more of a console game brought to your iPhone. If you haven’t played Dead Space 2 yet, this is a good start, though you don’t need to worry about any spoilers here. Gameplay involves the voice of a guy on the radio guiding your missions and tasks in “dead” space. The iPad version of Dead Space ($9.99) is a bit easier to play due to larger controls. There’s a warm-up stage where you can get used to the shooting and touch controls before you engage in real combat. The iPhone version is about 300MB and the iPad version 400MB. Move your character using the left side of the screen, and the right side is used to look around. Look for 40+ achievements throughout Dead Space. Overall, you get super sharp graphics, scary-ish action, and gripping audio effects. AppSafari review of Dead Space was written by Joe Seifi on January 19th, 2011 and categorized under Action, App Store, Featured, First Person Shooter, Games, Third Person Shooter. Page viewed 6514 times, 2 so far today. Need help on using these apps? Please read the Help Page. Wow, it looks great. Definitely faithful to the PC version. You see this reminds me of the PS3 version. Also be sure to check out JOSE COMES TO USA, http://bit.ly/joseUSA a highly controversial game!